Today I’m pleased to bring you a guest post provided by Dan Gilbert on behalf of Primrose Schools. For over 25 years, Primrose Schools have helped individuals achieve higher levels of success by providing them with an AdvancED® accredited, early child care services and education. Through an accelerated Balanced Learning® curriculum, Primrose Schools students are exposed to a widely diverse range of subject matter giving them a much greater opportunity to develop mentally, physically and socially. Dan has written a number of articles on topics varying from bilingual learning to teaching the importance of volunteering. How much time do you spend in the kitchen? Does this take away from the time you could be spending with your child? Dr. Mary Zurn, Vice President of Education for Primrose Schools, offers a new perspective on cooking; using it as quality time to spend with your child while helping them practice basic skills and learn new ones. “The kitchen is often the most popular place in the house for families to gather. It’s a place for learning and sharing, where the family can enjoy quality time. Children can also develop a sense of responsibility by participating in daily tasks,” said Dr. Zurn. Basic skills such as, sharing, following instructions and responsibility are easy to teach while you are cooking or baking with your child. Also, since you are around food it could be a wonderful opportunity to sprinkle some knowledge on your child about healthy eating habits. 1.) Ground rules should be set before children spend any time in the kitchen since it can be such a dangerous place. The hazards however, can easily be avoided with the ground rules and some adult supervision. Teach children to wash their hands before and after handling food to avoid spreading germs. Discuss on a regular basis what’s safe to touch and what’s not. Make sure the handles of pots and pans are turned inward on the stovetop so you and older children don’t accidentally bump them and spill hot liquids or food. 2.) Engaging your child in a meaningful way is very important no matter how old the child is. To entertain toddlers just give them some pots, pans and wooden spoons so they can pretend to cook with you or use them for music making. The tuneful accompaniment will let you know they’re safely engaged and give them a way to feel like they’re helping too. For older children, there are a variety of tasks they can accomplish independently. Simple jobs such as stirring, mixing, measuring and pouring can boost a child’s self-confidence and give them a sense of accomplishment. Tearing lettuce, adding sprinkles to sweets and rolling dough into balls are also safe, satisfying tasks children can easily accomplish. 3.) 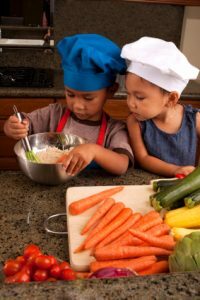 Children can develop many essential skills in the kitchen, such as counting, following instructions and learning measurements. For more advanced skills however, start slowly and have your child master easy tasks before attempting harder ones. Older children can gradually be taught to use a knife. Start them off with a dull spreader, cutting softer items first such as cheese or dough. As your child’s coordination develops, they can move on to slicing or sawing vegetables and fruit with a plastic knife. 4.) Most importantly, make sure you always keep it fun! We all know cooking can be messy, even when the children aren’t around! Instead of stressing over the “oops” moments offer guidance and let your child try again. If the cookie batter ends up on the floor instead of the baking sheet, oh well! Cleaning up is another important lesson to learn, and it can be just as fun! After everything is finished, sit down and enjoy your meal with your little sous chef. Offer them the first bite and see what they think! Discuss what they might like to make next time, perhaps some dessert instead of an appetizer? Until then, bon appétit!